The Tree Lighting is a Downtown Boise Tradition! Boise Mayor Bieter lights up the Christmas tree in the Grove Plaza in Downtown Boise, while families in attendance sing carols and join in the candle lighting ceremony. The community is invited to attend this traditional event that lights up downtown and welcomes the holiday season to the Treasure Valley. 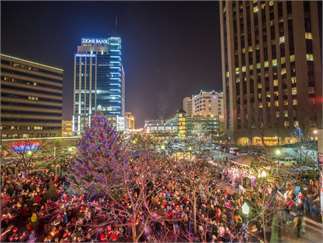 Please visit the Downtown Boise Tree Lighting webpage above for the list of performers and schedule for the evening.